Now, I am taking a few requests before wrapping up the project. Yesterday, we examined how the document on Page 198 was faked. Today, we’ll examine Pages 213-215 at the request of Regular Anonymous Correspondent (who e-mailed me with some more pages. I hope I haven’t lost track of them). About yesterday—faking documents is a serious charge and I did e-mail Wolfe to see if he’d care to comment. Well, I haven’t heard from him as yet and that e-mail address is the only way I have to contact him. So I rooted around ReganBooks’ website to see if I might contact someone there for a response. And you know, I’m starting to feel sorry for them. I mean here’s a big company and they can’t even spell the name of their own senior vice president in his own press release. I mean, it’s sad, don’t you think? I’m going to give Wolfe a few more days to respond and then I’ll see if someone at ReganBooks cares to comment. I mean, it’s not like these pages cut themselves apart and pasted themselves together all on their own. They had to get a little help from somebody, don’t you know. The title of this chapter is “The Control Question” and I haven’t a clue what it means. Maybe I’ll find out. Hm. Margaret Hamilton handed out diplomas at Beverly Hills High. Gosh I hope Wolfe isn’t going to accuse HER of killing the Black Dahlia. Ah no. Time to dredge up another CDP (conveniently dead person) or two. Wolfe is talking about his old amigo Manny Robinson, son of actor Edward G. Robinson. “It was through Manny that I met Arthur James at the Holiday House in Malibu. Owned by prominent artist Gerald Murphy and his wife Sara, the Holiday House stood on the cliffs overlooking the Pacific Ocean and became a hideaway for Hollywood celebrities who didn’t want to be seen in public with the wrong woman—or the wrong man. Lana Turner and Johnny Stompanato used to stay there, as did Marilyn Monroe, upon occasion, with a young congressman from Boston named Jack Kennedy. Let’s get rid of some easy stuff. I dispense with Uncle Vern and Bugsy Siegel’s trunk way back near the beginning. I won’t rehash it all now. I’ll just mention that records show Wolfe wasn’t even living near Bugsy Siegel when he says he was. If you really want to get into all the Uncle Vern nonsense, use the freefind search feature on my blog. There’s more than you’ll ever want to know about Uncle Vern, the prosecutor who never was. I wonder if the Murphys’ romantic little getaway ever got written up in The Times. Oh let’s check just for fun. (Fun being a relative term for a total research drudge). Hm. Poor old Edward G. Robinson Jr. died in 1974 at the age of 40 after a very messy life. His poor dad. But nothing about the Murphys’ celebrity crash pad and tryst joint in The Times. Hmmmm. Gerald and Sara Murphy seem to be the couple that inspired “Tender Is the Night,” well at least if you can believe anything on the Internet. Is this the same Gerald and Sara Murphy whom Wolfe is talking about? The ones with tryst central in Malibu? Except they returned to New York? Because I’m a simple man and I’m starting to get a headache. Let’s keep digging. Apparently the Murphys lived at 1737 Angelo Drive in Beverly Hills, but it was when their children were still alive (they died quite young, sadly, in the 1930s). Not the 1950s. 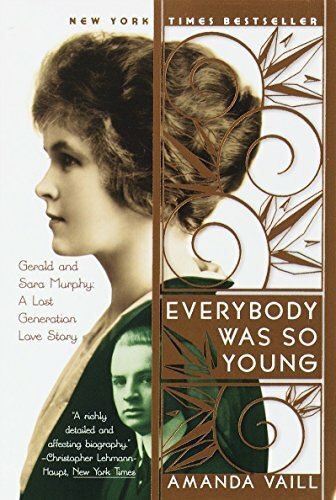 OK, Amazon.com’s “search inside” feature for “Everybody Was So Young: Gerald and Sara Murphy” turns up nothing for Edward G. Robinson Jr. Just someone’s dog named Robinson. Hm. Don’t find any reference to “Holiday House” either. No Wolfe except “Elsie De Wolfe.” Nothing about Malibu, except the Murphys going to a party given by Marion Davies. And nothing about Arthur James. Now my head is really starting to hurt. Apparently the Murphys bought a home in Rockland County, N.Y., that had been built in 1700 by the mayor of New York. Looks like they called it Cheer Hall. A summer home in the Hamptons?! Where is the stupid Malibu party pad Wolfe is talking about!? I’m getting annoyed! You think it gets better? The next two pages have to do with crackpot Arthur James, who came forward after Elizabeth Short was killed and claimed she posed for a couple of his paintings. He was featured in a Page 1 story in Herald-Express on Jan. 27, 1947, and was never heard from again. He never appeared in any other newspapers, just the Herald. James, who was 56 and awaiting sentencing on a forgery charge, told the Herald he knew Elizabeth Short for three months after meeting her in a Hollywood cocktail lounge in 1944. Recall that in truth, Elizabeth Short wasn’t even in Los Angeles in 1944, so we know none of this is true. “For this offense, James commented, he drew a two-year sentence to Leavenworth. As I say with tedious regularity: Proof once again that “Severed” is 25% mistakes and 50% fiction. And note that James was in Tucson not Phoenix. I swear Wolfe can’t read what’s in front of him. Oh it gets much, much worse. Wolfe says Arthur James, the struggling artist, managed rooming houses for Florentine Gardens business manager Mark Hansen. And where does Wolfe get that nugget of information? Because it certainly isn’t in the district attorney’s files. My dear Holmes! No attribution whatsoever! What else do you expect? Wolfe also claims Hansen had some downtown dance halls. False—he just owned movie theaters. OK, now remember, James’ story is completely false because Elizabeth Short wasn’t in Los Angeles. But according to his story, he and Elizabeth Short were in Arizona in November 1944, because that’s where he got arrested. Not Los Angeles. Also according to his story, he didn’t lose track of her—he was in prison for two years. Gosh, isn’t it hard to keep track of stories when they’re not true? Now here is Arthur James, the soul of veracity: a convicted check forger whom we’ve caught lying that he knows Elizabeth Short and further caught in a lie that he bought her luggage. Now we’re to believe that he knows about Norman Chandler? I may take another crack at the second part of this tomorrow, as it’s a rather foul bit of work. Time for my walk. I need to air out my poor brain cells after this one. This entry was posted in 1947, Another Good Story Ruined, Black Dahlia, Books and Authors, Cold Cases, Crime and Courts, Donald Wolfe, History, Hollywood, Homicide, LAPD, Uncategorized and tagged 1947, black dahlia, Books and Authors, cold cases, crime and courts, Donald H. Wolfe, lapd. Bookmark the permalink.